Health and diet are important to people everywhere. Many people have turned to taking harsh grains out of their diets, as well as, gluten, dairy, refined sugars, and other ingredients that don’t mix well in their bodies. Choosing to omit certain ingredients from your diet doesn’t have to mean bland, “diet” tasting food. These almond flour crackers, for instance, taste amazing! Almond flour crackers are very paleo. They are accepted within a carbohydrate diet. What is so amazing about these crackers is that they are gluten-free, as well as vegan! 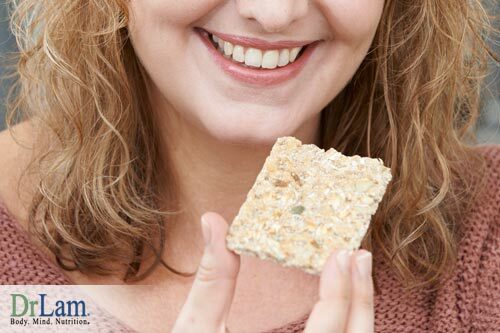 You can also add things like whey protein or sunflower seeds to a recipe for almond crackers. Sunflower seeds are so very nutritious since they contain: vitamin B1, vitamin E, phosphorus, thiamine, selenium and essential fatty acids. When you are on a restricted diet, it is even more important to make sure you include essential vitamins and minerals into your ingredient list. Adrenal Fatigue Syndrome (AFS) is a syndrome causing imbalances in your adrenal gland. This is due to stress, both external and internal, taking a toll on your body. The many symptoms of this adrenal fatigue syndrome include lack of energy, lightheadedness, unexplained weight gain, low body temperature, hypoglycemia, difficulty getting up in the morning and many other symptoms that all seem unrelated but can be linked to imbalances in your adrenals. Over time these symptoms can worsen and even cause adrenal exhaustion. For those who suffer with adrenal fatigue syndrome, diet and proper nutrition are very important. Foods that stress the digestive system can cause increase overall stress in the body. This can cause your adrenals to become tired and sluggish. Eating too many grains can increase inflammation in your body. It’s especially important to avoid refined grain products in the morning. This is especially if you want to alleviate some of your AFS symptoms. The almond flour crackers would be a good alternative snacks to limit gluten intake. However, even though almond flour is a good substitute, one should always use it in moderation. Compared to wheat flour, too much almond flour can increase calories. The fats in almond flour may not be as stable in high heat, potentially leading to more inflammation. Since almond flour may also be high in enzyme inhibitors, which are concentrated in nuts, too much intake may cause some digestive issues in some people with weak digestive system. almond flour crackers with saltAdding a bit more salt to your diet may be helpful, as well. For those with heart conditions salt can be harmful, however for those with AFS it helps replenish the sodium-potassium pump. If you choose to eat these crackers as a morning snack, omit adding fruit to them. Fruit is not good in the morning for adrenal fatigue. Fruit could cause a spike in sugar. It is also important to regulating your blood glucose levels if you feel adrenal fatigue is a concern. Lastly, it’s really great to avoid processed foods and actually make your own food. Preservatives and additives can actually cause health problems for adrenal fatigue. As for all diets, be sure to talk to your physician or a specialist before starting a new one, especially, if you suspect adrenal gland disorders. It’s important to really understand which foods are good for your body and which foods can be problematic. It never is a good idea to start any extreme change in your diet without consulting a professional. The NeuroEndoMetabolic (NEM) Stress Response is a model that shows how your body responds to various stresses in the body. This is a conventional model that shows how your neuroendocrine system manages stress levels, and how this is related to your body’s organs and systems. The neuroendocrine highway called the hypothalamic-pituitary-adrenal (HPA) hormonal axis is responsible for handling these stressors and keeping the body in check. A good nutritional diet is essential for alleviating and fighting adrenal fatigue syndrome. It also plays a key role in maintaining homeostasis within your body. If you disrupt this homeostasis, it will deregulate the NEM stress response making it hard for you to cope with stress. It will cause you to feel fatigue and quite possibly worsen symptoms of AFS. Keep in mind that your body needs good proteins from fish, meats and other healthy sources if your adrenal gland is acting up. Diets that omit these dietary staples may not be a good idea. Diets without these proteins will not help you fight symptoms of AFS and can even weaken adrenals. Be sure to talk to a dietary specialist or nutritionist before undertaking such a diet. You are what you eat is very true. What you put into your bodies will help or harm your systems. These almond crackers seem to be an ideal choice in a healthy snack for AFS and your NEM stress response. So, overall, almond flour crackers are nutritional for you when taken in moderation. They are good substitution for crackers made out of wheat flour, which many with AFS can’t tolerate. You can not go wrong with that! Eating right has a huge impact on how you feel. For a more savory snack, replace cinnamon, nutmeg, and apples with 1 cup pine nuts and 4 basil leaves. After 1 hour stir the chia seeds. They should be a thick consistency. Add all ingredients eggs, olive oil and almond flour, chia seeds, cinnamon, nutmeg, dried apples into a mixing bowl and season with salt and pepper. Mix until dough starts to clump together. Form into a ball and roll out between two sheets of parchment paper to 1/8 inch thickness. Bake in oven for 10-15 minutes. They can burn so make sure to keep an eye on them. Once crackers have turned golden brown remove from oven and allow to cool. Enjoy! Can be used with your favorite dip or any way you like.